We know it's hard to free up your schedule for every single match during the week. Sometimes, plans change. 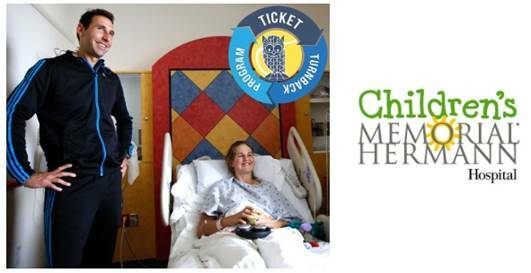 That's why we created the Ticket Turnback Program to benefit the Pediatric Trauma Center at Children's Memorial Hermann! If you are holding tickets for a session you cannot attend, donate those tickets back to our resale program. We will sell those through our box office for face value, and 100% of that resale price wil donated to Memorial Hermann. Want to participate? Simply email tickets@usmensclaycourt.com or call the box office at 713-527-0345 and let us know you are not using your tickets for a particular session. We can reprint the tickets on site, so no need to make sure they get back to us. The Ticket Turnback Program has raised over $245,000 for charity in its first decade. Please call the Box Office at 713-527-0345 or email tickets@usmensclaycourt.com for more information. Note: Season tickets for box seats are sold out. To be added to the waiting list for these seats, please email tickets@usmensclaycourt.com. Players and times subject to change due to injury or unforseen circumstances. Refunds are examined on a case basis, requests must be made 2 weeks prior to the event. Rain Policy: Should a session be cancelled/rescheduled due to rain, we will make every effort to accommodate those ticket holders for when the session is rescheduled.